The Verdict: The menu said shaved ham but shaved ham was not what I received. Shredded ham instead was produced as part of the Finnigans Chin Chicken Parmigiana and it would be fair to say that it never really recovered from there. Add in some half cooked chips and another ordinary salad and this offering left me feel both disappointed and, immediately after eating, a little bit green around the gills. 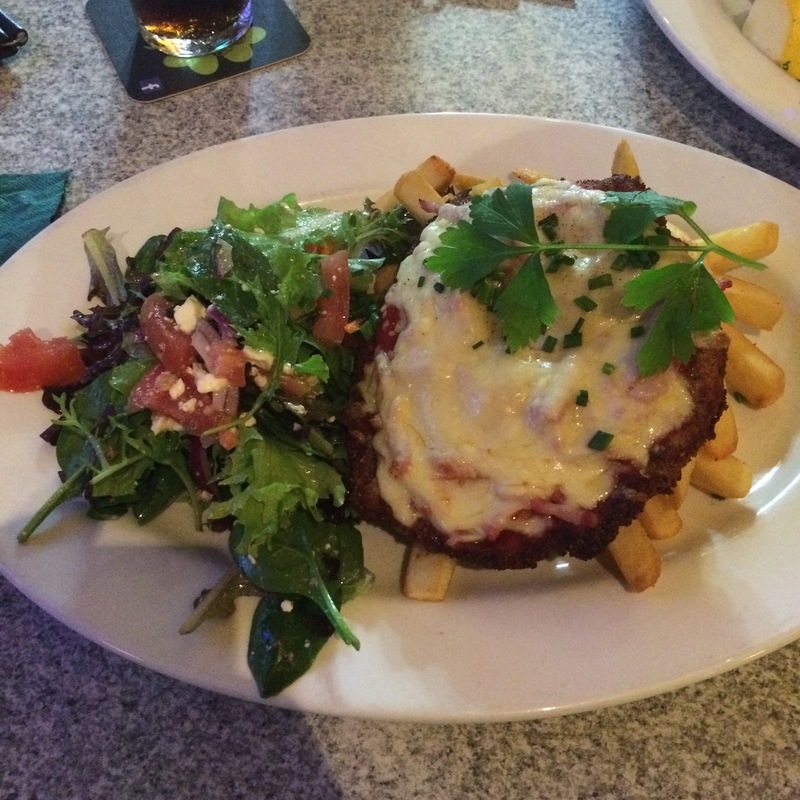 Chicken: The chicken piece was described in the menu as being crumbed with parmesan and parsley. I could not taste either and wonder if the menu did not match what was produced by the chef in this respect as well. That aside, this chicken piece was actually quite good. It was well cooked, if a little charred around the edges of the crust, and tasted great. Tomato Sauce: This was the best part of the Finnigans Chin Chicken Parmigiana because it was both abundantly layered on the chicken piece and was very tasty. It complemented the chicken and the cheese very well. Ham: If the tomato sauce was the best part of this chicken parmigiana, then the ham was, easily, the worst part. The fact is shredded ham does not have the same taste or coverage as a piece of shaved ham. The little ham that was on my meal really added nothing in the taste department. As for coverage: if there had have been any less ham on the chicken I would have been justified, I think, in refusing to call this a chicken parmigiana. Cheese: A close second to the tomato sauce as the best part of this dish, the cheese was also bountiful. It was very well melted and complimented the chicken and tomato sauce well. Side dishes: The side dishes in recent weeks have been a mixed bag. Not so with last night’s parma because both elements of the side dishes were bad. The chips looked well cooked but close to 40 percent of them (that I ate) were, at best, still cold in the middle. The sensation of biting into them and realizing how undercooked they were left me a little queasy. The salad was deceiving: it looked great but was limp and bland and, not for the first time on this quest, had the texture of being over refrigerated. Presentation: The picture above speaks for itself. This was a fairly large plate but still the chicken piece came out entirely covering the chips. The Venue: Finnigans Chin Keperra is in the Keperra Shopping Centre on Settlement Road in Keperra. It is styled as an Irish Pub and has a large outdoor area as well as a cozy bar area inside. Parking is plentiful. My parma cost $19.50. The Final Word: If the menu says that shaved ham will be served as part of the dish then shaved ham should be provided. It is as simple as that. Looking past the misleading and deceptive conduct of the chef apropos the ham other elements of this dish let it down, not the least being the cold undercooked chips. Postscript 1: The Parma Consigliore and I ended up at a pub near home last night to ensure we were home in time to watch certain television programs. The Underdog will return to the schedule later in the year. Postscript 2: From every dark cloud comes a silver lining. After eating our meal we did some brief grocery shopping and I discovered back on the shelves at Woolworths the excellent chilli and garlic sauce that had been produced as part of the show “Recipes to Riches” a couple of years ago. After working my way through four and half bottles the last time it was on the shelves (because it is brilliant) I have not been able to wipe the grin off my face since finding it. This entry was posted in Uncategorized and tagged Brisbane, brisbane best, brisbane eats, brisbane food, chicken, chicken parma, chicken parmigiana, finnigans chin, keperra. Bookmark the permalink.